Poets, like any craftspeople, work best with a good set of tools–interesting, meaningful words. Inspiration may take a draft poem out of the box, but words are the tools that assemble it. The verbal tools that are often hardest for me to keep handy are, well, verbs. Keep in mind that all verbs are NOT created equal. Some, passive or generic, are kind of pudgy, blah, while more active verbs can be tensile instruments, verbs that really do things–sift, rattle, splatter, caress. It is easy to slip into the groove of the passive voice writing poetry, relying for color only on nouns and adjectives — i.e. roses are red, violets are blue. When more active verbs are inserted, however, a whole new dynamic arises; different points of view can be instantly assumed and sharpened: i.e. roses burn, violets frost; roses rouge, violets shadow; roses lip, violets tattoo; roses redline, violets ink; roses kiss, violets weep. These technical verbs can be especially interesting when used in a completely different context from the craft or job with which they are associated–i.e.the ocean braises the beach. The job poached her brain. Her glance peeled his clothing. An exercise that I sometimes do to spice up my own verb usage is to choose a profession – something relatively manual like a cook or farmer, sailor or sculptor, pirate! (To name a few.) Then, I think make a list of all of the specific actions that people in that job do – the job’s verbs. With that list in mind, I then try to write about something completely different. For example, if the occupation is nurse, the poem might be about a sunset. If the job is carpenter, the poem might focus on family reunions. Sticking to one single profession or craft, rather than a bunch of different crafts, is nice as it creates a single extended metaphor. heavy leaf and humid longing. So! The prompt for today is to pick a craft, trade, job and to think about the specific verbs (or really any words) associated with the craft. Make a list of those words, if it helps to have them in front of you–if you push yourself a little, the list can get quite long. THEN, write about something completely different, incorporating, if you can, some of those specific strong technical verbs. If you do not want to be bothered with this type of exercise (and I know it’s a SATURDAY! ), then think about any craft or trade or job that interests you and use that as a jumping off point. But do try let some of the specific grit and intricacy of the craft’s words inform your poem. Post your poem on your blog. got a little graphic maybe…smiles. and i love your elephant.. Thanks so much Brian. I’ve been very busy this morning with visiting mother (90) so got post up but I want to do a new poem rather than an old one written in this way. But we’ll see how long that takes – and I WANT TO START VISITING myself. People should bear in mind – as you always do when you do form pieces– that the important thing in the end is writing your poem! The exercise just a jumping-off place not a strait-jacket! K.
Thanks, Tash. Looking forward to it. Sounds pretty nice, actually – low blood sugar a nice thing to repair! K.
Yes, it is! And glad no boy needs antibiotics from canal water! K.
Thanks, Hedge. I have some others and may put up too, but I’m going to see if my aging brain can come up with something new unless it takes too long. K.
You will be thrilled to know I have mangled your prompt a bit, but –saving grace–included punctuation to bribe you. I combined it with a form challenge and actually it transformed a pretty dumb poem into one I like now, so many thanks. Ha. I’m sure it’s great. I’ve got a lot going on in my apartment right now, but I’m sneaking to the side of the living room! K.
I just love this prompt Karin…I’m addicted to verbs! I think this is just what I need to get writing again. It’s been tough. Hard to believe that coming from you, Victoria, as your work always has the grace of effortlessness (at least to the outsider!) I do find an exercise type of thing can be helpful though when stuck. k.
I think I mighta snuck a few in mine. What an interesting, insightful article! I’m looking forward to trying out your ideas. Thanks! I very much look forward to seeing this in limerick form. Aaah now all becomes clear. I tried to jump the gun earlier today and write something about a job thinking that would do it. What a treat though! A proper lesson in poetry, which for someone without any kind of College or Univeristy qualification in literature, four kids and little time or cash to spare for retraining, is a real blessing. Thank you for sharing your poetry prowess and teaching me a new technique… Off to give it a go, will be back later…. any chance you could save me a bar stool and keep a G&T on ice til I get back? Absolutely – and feel free to post what you’ve already written! I’m sure it’s very interesting. K.
Will check it out! K.
I’m half way there. Mind buzzing like a dentist’s drill. Yes- I can’t help thinking of Marathon Man! k.
So I have something up at last – sorry for my distractedness! 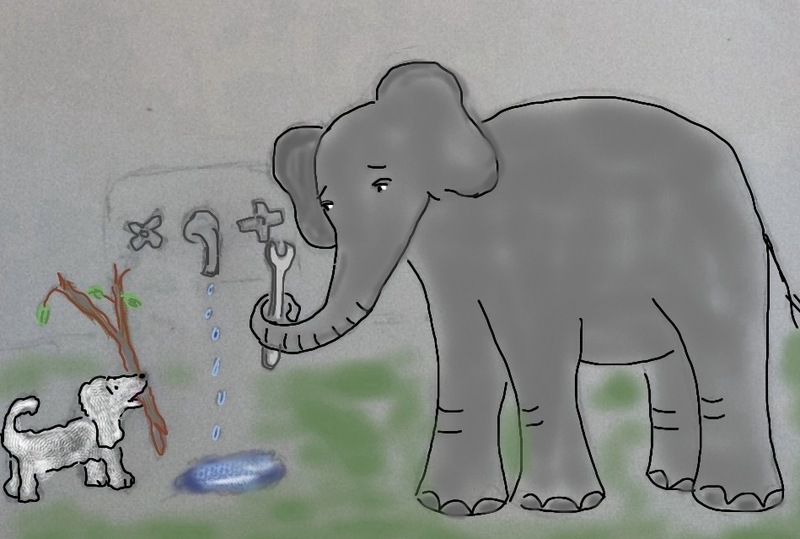 K.
another fine elephant at your place…is that sun glasses on the fish? smiles. i sometimes write about my job…encoded in metaphors…haha..
Really interesting prompt. Had to dig deep to think about this one, thanks Karin and all at the pub! very cool poem bren with the statue on the hill of miracles.. I managed to do it!! I wanted to write about this ache, this palpitation I’ve been having and surely it isn’t a Heart-attack! So, I HAD to write it down to make me feel better. As I was wondering how to put it into words, this family of mine, made things easier(or tougher! ) by giving the prompt. But it was very creative! Hope you’ll like it! Do leave in a comment! And @ManicDdaily, you’re awesomeness! Thanks for the prompt! Well, thanks so much. I am having a lot of family issues at the moment – all good, but hard to write so looking forward to yours! K.
Take care there! It’ll be good.Hang in! Very nice! Both develop a wonderful savor with age. Good comparison. k.
Thank you, this is one technique to write a poem, I’ve got to try it. I do not have a poem yet, I’ve got to try it, thank you. You are very welcome. K.
I gave it a shot. I loved the idea of playing with the verbs. Cute image, but I worked with where I was in life. Thanks for saving me a spot. THIS was an excellent exercise! Thank you! I’ll be reading lots of these tomorrow…I’m excited to see what everyone has done! Smiles!! Thanks, Hannah. Look forward to yours. K.
A brilliant challenge. I have not done it justice, but it is definitely something I shall experiment with in the future. Endless thanks for. Great prompt! Apologies for being a little late to the pub! Need the hair of the dog this morning! So looking forward to reading!!! LOVE strong verbs. LOVE this prompt. Thank you! Whimsy – Im not Sure I saw your poem — am in a car now en route to daughter’s graduation so may have some delay in checking out but will try. K.
Absolutely 24 hour! All time zones. K.
Looking ahem forward to it. k.
Great prompt and emphasis on verbs as little motors. Thinking of my hairdresser’s tools jumped me right to death. Yours worked very well. Thanks. k.
Ha! Very funny. Thank you. Enjoyed your poem! And church programs are a great source of inspiration if not always in themselves but a place to jot. K.
Loved the article and the exercise K. Sorry I couldn’t play. Spent all weekend writing a training manual required at work and will spend tomorrow training new employees. Might free me up a little after a time, though. I’ll try to use the exercise in an upcoming poem. Thanks for the challenge! I think I’ve gotten to everyone but I am in the lucky position tonight of going to my daughter’s graduation from her masters’ program–amazing! with my 89 year old mother and others in tow so not quite able to be systematic. Thanks so much for your interest, and am very glad people enjoyed the prompt! k.
ps – do give a shout-out if I missed you. I know Brian and Claudia are indefatigable and never miss anyone, but I really want to check out the poems so do let me know if you haven’t heard from me. k.
Thanks. A lot of stories – too long to relate. I think it will. I feel very blessed. k.
It’s been too long since my blog has been active, but thanks to all of the poets who’ve been reminding me about this group. And thanks for the great prompt! It’s a very supportive group and we’re happy to see you back! k.
Thanks, Karin! It’s great to be starting my morning again by reading a batch of fabulous poets! It has been a long weekend. On Saturday we drove from Michigan to Ohio to watch the Avett Brothers perform. They were in Michigan the day before, but that did not work with our schedule. We were checking into our hotel when the prompt posted, but the excitement of it all kept me from thinking. Back home and exhausted I post. Thanks to my wife who would not let me not post. I’m also sending thanks to your wife! k.
getting a coffee and then catch up with the overnights….good morning..
Used my legal experience to write something…not especially “active” though…but was a fun prompt. Thanks, Karin! Thank you, Bodhirose. As a attorney myself, I am curious and will check out. k.